I had a wonderful Douglas Adams-themed weekend of odd. 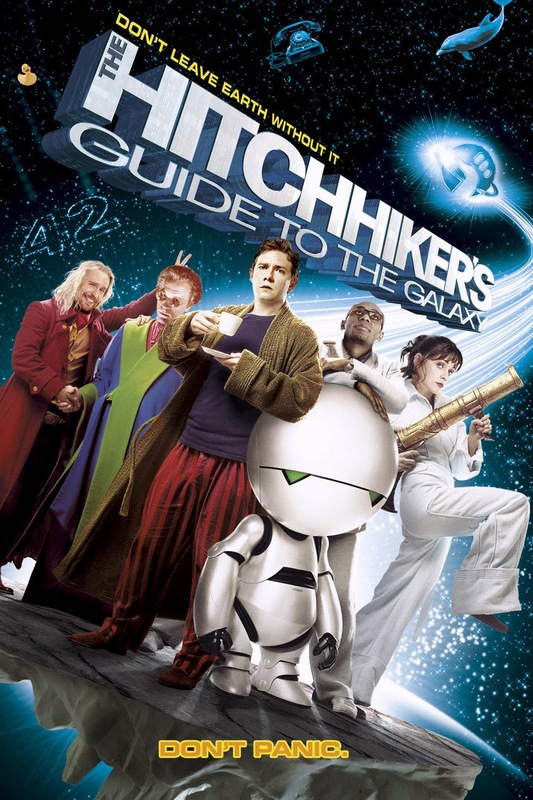 After falling madly in love with The Hitchhiker's Guide to the Galaxy last December, I moved on to the sequel, and I also (finally) saw the 2005 movie adaptation with my girlfriend and bromosexual life partner Tom. It had been on my radar for such an insanely, shamefully long time that it would have messed up my psyche if it were bad, but I am pleased to inform you that H2G delivers, although the book remains lightyears ahead of it. When the Vogons destroy Planet Earth to make way for a hyperspace bypass, hapless Earthling Arthur Dent (Martin Freeman) at the last instant hitches a ride on a Vogon ship with alien friend Ford Prefect (Mos Def). When discovered, they are thrown into space, but luckily are picked up by the Heart of Gold. The stolen spaceship is manned by Ford's semi-half brother slash President of the Galaxy Zaphod Beeblebrox (Sam Rockwell), Trillian (Zooey Deschanel), and Marvin The Paranoid Android (voiced by Alan Rickman). Zaphod is seeking the planet Magrathea, where he hopes to discover the Question of Life, the Universe, and Everything. Screenwriter Karey Kirkpatrick was definitely liberal with his interpretation of Adams's book. The major outlines are more or less the same, but I don't know if Adams, who did co-wrote the script but died before its making in 2001, agreed all that much with new characters Humma Kavula & Questular Rontok, the Point of View gun, and the very un-Adams-like love story between Arthur and Trillian. Still, I admire the makers for adding to the legacy. And I absolutely loved being submerged in the Hitchhiker's universe, and how Jennings brought together an all-star cast (Stephen Fry, Bill Nighy, John Malkovic, anyone?) for this massive undertaking of delightful absurdity.